For 2019 we’ll be using the same 55k route as we did this year, in 2018. This is a full point to point route, from Whistler’s Cheakamus Canyon area, over the very top of Whistler Mountain, along the stunningly beautiful Singing Pass, and then finishing up along the challenging windy singletrack of the Comfortably Numb trail system. The climbing stats seem very reasonable with “just” 2800 meters / 9200 feet, it can’t be that hard… right? Well there’s good reason why even the fastest runners failed to crack six hours on this route in 2018 as it’s a beast of a climb right off the start, and then super technical near the very end, when your legs are screaming at you to just stop it already! The 55 km race is made tougher still be there being just three aid stations along the entire route, meaning runners need to be much more self-sufficient than at other 50k races where it’s common to see twice as much on course aid available. 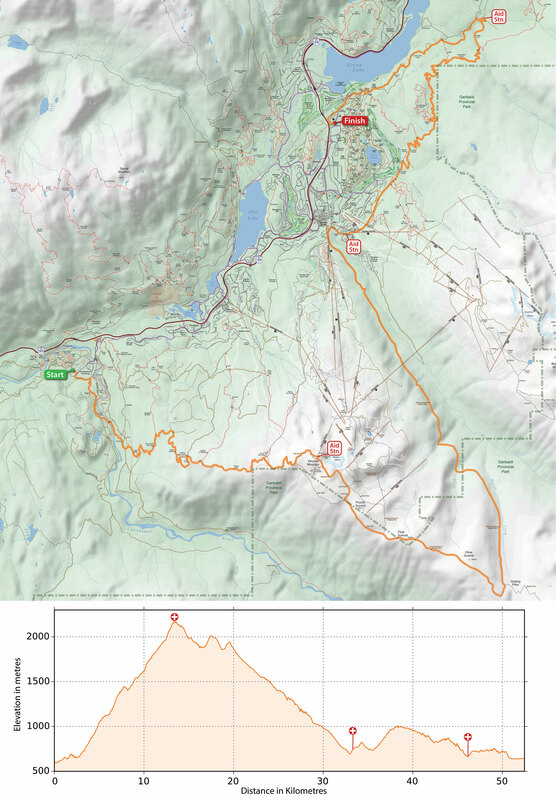 This is of course due to the remote nature of much of the route and we would certainly classify this as an “advanced” 50k race, not to mention those extra five kms that bring it to a total of 55k. 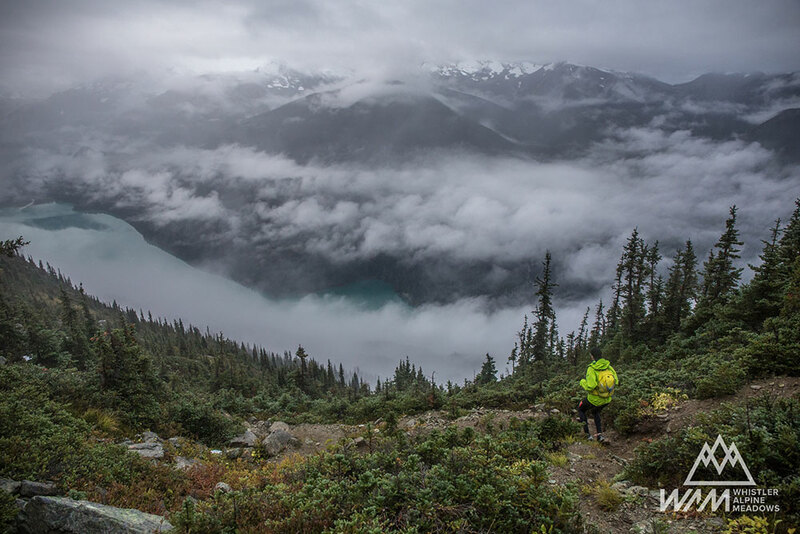 With this event being held on the back half of September we’ve seen it all, and just this past year runners were trudging through fresh snow on the upper alpine regions, so ensure you come prepared, it’s an adventurous one, but with plenty of reward as the views from atop Whistler Mountain and along Singing Pass are right up there with some of the most sensational vistas you’ll find anywhere in the trail running world! Click the map above to view a larger image. All races will have finish line drop bags, which will be under a tent which is not monitored so please label your bag and do not leave any valuables. Our aid stations feature all the good stuff courtesy of Nesters Market & Hammer: water, Hammer gel, Heed electrolyte, Coke, chips, fruit, nuts, cookies, soup, pickles, bacon, sandwiches, vegan options and other surprises (each AS is different). Crew driving directions are forthcoming. Pacers: Pacers are NOT allowed in any distance due to permitting restrictions. 10 Essentials: We encourage everyone to always carry the 10 Essentials for backcountry safety in your pack – whether you’re out training or adventuring on your own or with friends, or participating in one of our extensively marked races, you can never predict what might happen. Learn more about the 10 Essentials in this article by North Shore Rescue. In our effort to reduce waste, all our races are now cup-free, meaning you’ll need to pack along your own cup for fluids at aid stations and at the finish line. Here are two suggestions: a collapsible cup (available in our merch store), or a homemade version cutting the top off an empty juicebox. For this race, we will have paper cups for soup for the longer distance Aid Stations. Anyone dropping out up to and including June 1 will receive a 50% refund of entry fees. 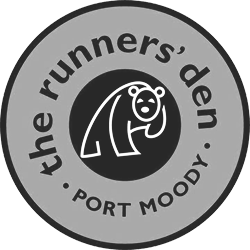 Up to and including 30 days before race day, you can receive a full deferral to any other CMTS event (if not sold out), towards a single other race only. Deferrals are only applicable for one calendar year from the race you transfer out of (meaning the race entry can be deferred to any OTHER race, but not the same race one year later). Entries can only be deferred a single time, to a single event. You can move down in distance, but not up in distance. No credit is provided for the difference in entry fee.